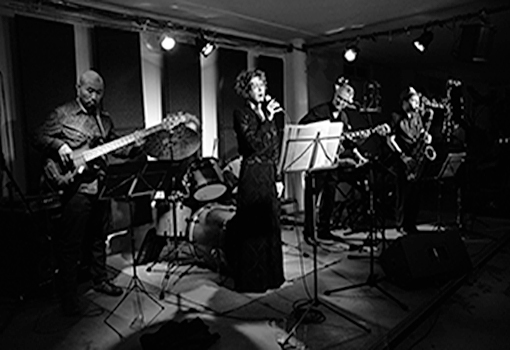 TRAVELOGUE is a contemporary jazz group, founded by guitarist Werner Tian Fischer. It includes saxophonist jürg wickihalder, drummer Gabriel Schiltknecht and bassist Fredi Meli. They interpret Fischer’s own jazz compositions and selected jazz originals by kindred spirits. The first Travelogue album “EASTBOUND” was recorded in Boston with an international musical outfit including bassist Nesin Howhannesijan from Berlin. in summer 2004 travelogue were invited to a 5 week long tour of the chinese provinces of heilongjiang and beijing. A second recording featured Swedish vocalist Sophie Dunér and again German bassist Nesin Howhannesijan. Lyricist Jan Krohn provided his trademark lyrics. “CHINESE SOUL” was released on Altrisuoni Records and the band toured with pianist/vocalist Mya Audrey and bassist ‘Big John’ Zhang Ling in China and Europe. The Travelogue composition “Bon Voyage” provided the soundtrack of the acclaimed documentary film portrait ‘NO FLASH’. Homage to Ricardo Rangel (1924–2009) – a tribute to the work and life of the famous Mozambican photographer – which was shown on screens in Switzerland, Portugal, Mozambique, England, Argentina and Brazil, as well as broadcast on RTP África and on Mozambican TV. The Travelogue Blues Band, a spinoff of Travelogue, was invited to the 2nd International CD Blues Festival in Beijing. The nucleus of the band (Wickihalder, Fischer & Schiltknecht) performed with British bassist Pete Townsend. The line-up changed again to include pianist Roberto Domeniconi, New York-based bassist Fredi Meli and occasionally bassist Hans Ermel. Their third studio album, “THE LIGHT IS ON”, was recorded with vocalist Coco Rouzier (USA) and released on the PBR Jazz label the following spring. The group's latest incubation, TRAVELOGUE - Chapter 4, includes saxophonist Katrin Marti, pianist Stefan ‘Jimmy’ Muff and drummer Lukas Landis alongside band regulars Fischer and Meli. “FORECLOSURE”, a passionate live recording from october 2016 was released at the beginning of the year.